So it’s been over a month that I’ve been running Milli in hopes to generate some profit. For those to you who are new to this site, Milli, or Bitcoins in general please go and read this post first as I’ve given there a complete breakdown to what I’m talking about in this post. It’s been a rough 45 days, but I’ve learned a lot. Bottom line I’m still not profitable and there are many reasons for that (we will get to them shortly). However one of the best things that happened to me in the past month is that I met Daniel D’alien from Bitcoin Aliens. He’s the guy who runs Bitcoin Aliens – one of the most successful (if not THE most successful) Bitcoin faucets out there. So I’ve had a lot of help, a lot of trial and mainly a lot of error 🙂 But I like making mistakes, it means I’m learning something new. So here’s my breakdown of what I’ve learned in the last 45 days. Use this to optimize the profits on your own faucet but remember that each website is different, so what works for me might not work for you and vice versa. The first thing Daniel set my attention to was the ad layout on my site. 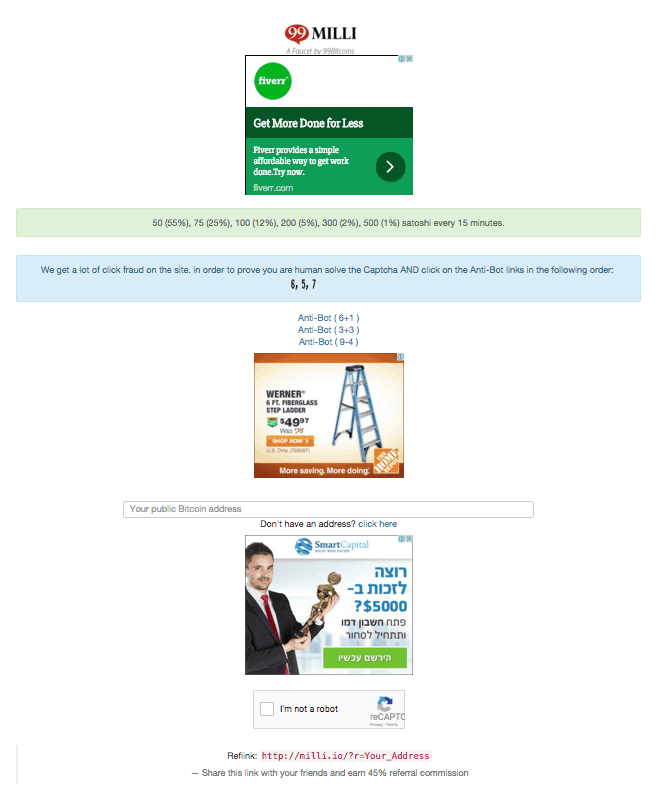 At the time I was using 3 ad sets from Google Adsense – two at the sides of the site and one in the middle. I’ve changed these ads to 336×280 rectangle ads and placed them in the middle of the page where people are focusing their attention. There’s also the fact that I’ve been running only display ads in Adsense (and not display + text). After reading about it a bit I learned that if you run display + text ads you get a much higher RPM. However I wasn’t completely convinced so I ran a test on my Adsense ads. This can easily be done through the Adsense dashboard. I split all of my ads to display only and text + display and saw what performed better. In 100% of the cases the text + display ads had a higher RPM. So starting today I’m showing text + display ads on all ad slots. A few things came up during these past few days that got me thinking if I’m doing anything that can actually get me banned out of the Adsense program. First of all it’s advised the you read the Adsense program policies and make sure you’r compliment with them. After going over these terms it seemed to me that most faucets out there today are actually violating these policies by making their site hard to navigate, putting ads up on pop-ups or placing more than 3 ad placements on their site. The site has an affiliate program (like all faucets) that may be considered as an invalid traffic source. However I couldn’t find any place stating that this as a direct violation. Google dislikes MFAs – Made for Adsense sites. Faucet could be considered such a site but my guess is that if you build the site properly (mainly with enough content) it will not get banned. So as you can see I need to take into account the fact that Google may one day just decide to ban my site because they feel like it. The more scary thought is that they will ban my account since this means I won’t be able to publish any ads on 99Bitcoins as well. However, you can’t just sit on the fence and wait to see what happens so I’m going to try and make Milli better in hopes it will continue to be considered a legit site. How much did I actually make in the last 30 days? Now to the part we’ve all been waiting for. Other than implementing Adsense I also signed up to Coinad. However I only put one Coinad ad at the moment as I don’t want to add to many variables to my tests. So for the purpose of this post I’m going to ignore Coinad’s revenue completely (they weren’t that much to begin with). If you add the 2.5% commission faucet box is getting it totals in 0.65642691BTC which at today’s exchange rate equals $295. So as you can see for the last 30 days period I’m actually losing money. The total comes up to a $36.95 loss. Why the hell am I losing money?!? The Bitcoin exchange rate – Bitcoin pretty much boomed in the past 45 days. And while I’m getting paid in USD I’m paying out my users in Bitcoin. If the exchange rate would have stayed the same as it was when I began running Milli I would be at a profit at the moment. However I didn’t account for this change in my faucet’s payouts which brings me to my next point. Knowing my ARPU (Average Revenue Per User) – Since Milli is getting a good amount of traffic it’s easy to calculate how much a single unique user is worth to the site. After making the calculations I got to the conclusion that a unique user brings me on average $0.007. Continuing my calculations I found out that the max payout on average I can send a user is 75 Satoshis. This may seem like a small amount but remember I’m giving away payouts every 15 minutes. 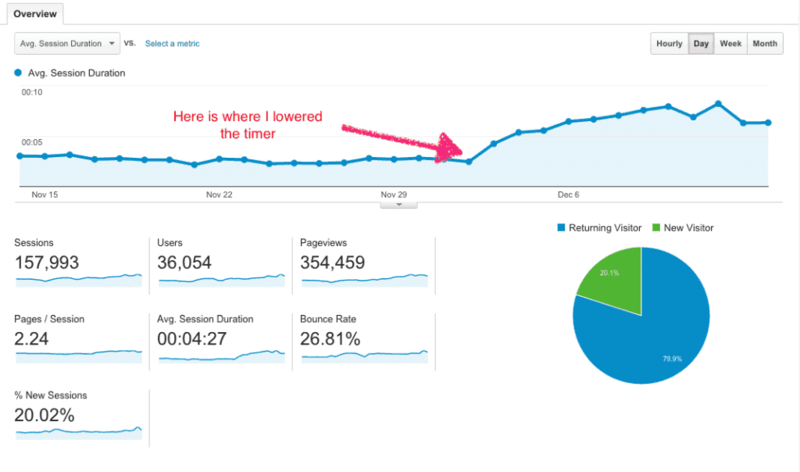 So the main conclusion from this whole scenario was that up until now I was just guessing what I should pay my users. Now I have a proven answer of how much I can pay them. I already implemented these calculations into the faucet and hopefully we will see the results next month. I will also adjust these calculations each time the Bitcoin exchange rate rises by more than $50. The answer is because the site isn’t working yet. What I mean by that is that until I can prove on a smaller scale that I can make a profit from the site there’s no point in driving in more traffic. It would be just like pouring water into a leaky bucket. So what’s next for Milli? Adding content and redesigning Milli so that it won’t look just like a cheap faucet site. Adding more revenue sources, mainly Coinad ads. Detaching myself from FaucetBox – I think I may hire someone to create a personal faucet script as I’m not getting the stats I need from FaucetBox. Also I may ask for people’s email in order to prevent fraud on the site. Make sure to adjust my payouts as the Bitcoin price changes. So that’s it for today, hope you enjoyed this update on my progress with Milli. If you have any questions, comments or anything you’d like to add let me know in the comment section below. But this will hamper your profit if BTC goes lower. Or you can take loan at Btcjam or other peer to peer lending sites and their you can fix BTC at current USD prices . Nice job, thank you. After watching your video and reading your progress my enthusiasm for always wanting a faucet has been put on hold. I was inspired to take the bitcoin plunge after what I learned here on 99, and I’ll be the first to admit I’m still on my learning curve. I’m still tweaking the site layout to optimize revenue. The traffic is good, but I have to monetize it better, much better. As someone in a similar situation, I also recently bought an active bitcoin faucet site (on Christmas Day no less), I eagerly await further updates on your experiences and successes!!! Thanks for this site, I’ve learned a lot in a short amount of time. So interesting! I really want to dive into setting up a faucet but I’m afraid of the time it will take to maintain. I’m learning from you Ofir! Thanks for sharing. great article. I started a faucet 42 days ago. new to the world of websites I rushed in and got banned from Google Adsense pretty fast for invalid traffic of all reasons, good to see you’re still working with them as the others available pay much under half of what you’re getting. I have been looking at other revenue streams like the rotator and product sales. check us out BitCoinBarry.com. how do you get on in these areas? well! what i think is, if you reduce the claim time, simultaniously you have to reduce the amount per claim too to maintain your profits. If the claims are very low, people may not visit the site any more because this is not the only website out there. So it may cause your trafic too. What if you pay out random amounts(just like claims upto 5000). It may give some kick for the visitors to try the next claim too. Bitcoin aliens also follows the same way. See bonusbitcoin.co too. I know now why your blog become more popular everyday.